India’s decision three years ago to make pre-payment of bilateral debt owed to several countries helped in its being seen in a positive light by many developing countries. A similar approach could be considered for loans from World Bank, explaining why it makes sense for India to stop accepting assistance from the Washington institution. India has been one of the largest beneficiaries of World Bank-assisted schemes in the last few decades, because of which several health and education schemes were implemented. But in the life of every society and country, there comes a time for it to stand on its own legs, particularly if the country has ambitions of becoming a global power, as it cannot be a supplicant and also an aspirant to the high table of power. Thus, it is perhaps time for India to say good-bye to World Bank assistance. During the tenure of the National Democratic Alliance Government, a decision was taken to forego bilateral assistance from several countries. At that time the idea was received with scepticism by many. But the burgeoning foreign exchange reserves justified that decision and it also facilitated larger benefits to some of the poorer countries. First, taking advantage of our comfortable forex reserves and lower domestic interest rates, the Government effected premature repayment of `high-cost’ currency pool loans of the World Bank, and of the Asian Development Bank totalling around $3 billion. The then Finance Minister, Mr Jaswant Singh, initiated the following steps in the light of the above. The Government decided to (i) discontinue receiving aid from other countries except the following nine: Japan, the UK, Germany, the US, the EU, France, Italy, Canada and the Russian Federation and (ii) to make pre-payment of all bilateral debt owed to all countries except the ones mentioned above. Since July 2003, India has become a net creditor to the IMF, after having been a borrower in the past. The Government has written off debt worth $30 million due to it from seven heavily indebted countries as part of the “India Development Initiative” announced in February 2003. The interest rate continues to be reduced and is around 6 per cent. This is the lowest in the last 30 years and it is stimulating consumption and investment. These initiatives were largely welcomed and did not seem to have had any major impact on our development paradigm. Actually, it helped in India being seen in a positive light by many developing countries. Similar arguments could be considered for loans from World Bank, both the soft and hard variety. Considering our foreign exchange reserves and balance of payment positions, it may be the appropriate time to forego assistance from the World Bank. Table 1 shows the overall external assistance, authorised and utilised, both for loans and grants. The grants portion constitutes around $570 million during 2004-2005, and the total is $3,930 million; in rupee terms it is Rs 17,151 crore. Given our GDP figure of Rs 24 lakh crore and a savings figure of Rs 9,07,416 crore during 2004-2005, this constitutes a small portion of our national aggregates. We also find that the assistance utilised is lower than that sanctioned throughout the period — sometimes as low as 60 per cent. Table 2 lists the source-wise external assistance that has been utilised by India. Almost all the assistance from World Bank and other development agencies is in the form of loans, and it was of the order of $2,400 million during 2004-2005. This is from World Bank, ADB and IDA put together. If we look at our foreign exchange position, as seen in Table 3, it was $143 billion in November 2005 and, hence, the aggregate assistance from these institutions are not critical from the point of view of our exchange position. We can always acquire technology or other requirements for a project by paying in the international markets. 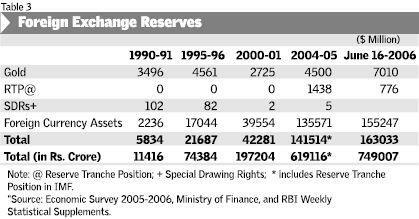 There was a time in the 1980s when India needed to get forex loans and support for rupee expenditure. But with its burgeoning forex reserves it need not be constrained by the amount it gets from the donors. After all, self-help is still a good principle that can be practiced particularly when the country is aiming for two-digit growth rates and currently holding (week ended June 16) more than $160 billion as foreign exchange reserves. There are other important issues linked with India’s continued dependence on World Bank aid. That is related to its ambition to be considered a world power. It is interested in being included as a member of groupings such as G-8, etc., and this implies that India cannot be a recipient of aid from the others who are sitting at the same table. World powers would prefer equals, and not supplicants, in their midst. The other dimensions are related to the conditionalities associated with such loans and the many advisors who propagate a particular point of view. It has been reported that the World Bank has withdrawn its assistance in projects related to the health sector on the basis of complaints regarding corruption in the same. It is also suggested that the Finance Minister has written to the World Bank to reconsider the matter. The pressure of World Bank on this particular issue might be considered appropriate but, in the overall scheme of things, the requirements and conditions of the institution may not be appropriate for a country such as ours, which is poised to become a major player in world affairs. The design of the projects, type of execution and the measure of benefits are all typically in the jargon of the World Bank and, we seem to have lost our ability to think things through in an independent fashion on many crucial issues pertaining to development. Actually, it is the Planning Commission that should play the crucial role of formulating, evaluating and creating standards for projects. India should also be in a position to formulate its own social security schemes and initiate reforms in the financial sector based on its unique requirements. As for major infrastructure projects, such institutions as the Infrastructure Development Finance Company and the Planning Commission should play an important role. A large number of least developed countries will be thankful to us if we stop using World Bank assistance as the share of the pie available to them will be larger. We should also stop getting soft loans and grants from individual donor countries. Of course, there may be protests from those who may be unemployed in Washington and in New Delhi. India is a major client of the World Bank and the “India Story” is useful to them. If India is not a client then the India Story will be more catchy and impressive. It will showcase a borrower who has outgrown the situation of being a borrower and it will also establish the fact that World Bank has achieved something in developing clients who do not need the Bank any more. The decision to bid goodbye to World Bank may also bring smiles to the faces of the Left partners who are providing support to the Government at the Centre. Poverty alleviation can and should be done by India with its own resources and experts and the expertise and money available at Washington DC can be beneficially used by other less developed countries.